Look out Marilyn! Here comes "Bear"ilyn! 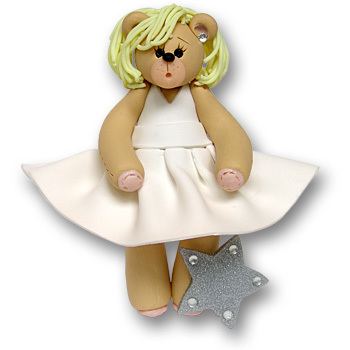 One of Deb's famous Belly Bears, “Bear”ilyn Monroe is a must have for any fan of Marilyn Monroe. She is dressed in the classic "Marilyn” dress and her outfit is completed with rhinestone earrings. This Belly Bear is truly a star! It may be personalized on the star but is not necessary. As always personalization is free! She comes complete with a hook and satin ribbon for hanging. Ther are limited quantities available. Handmade and designed by Debi Allison.